This is a quick way to reveal everyone’s interpretation of current reality with objective clues and form a common story about current reality. This exercise uses a Wave as a metaphor to categorize everyone’s perception of the reality. 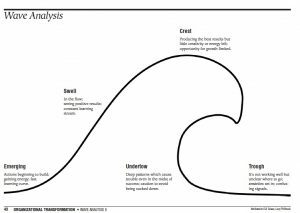 Overall reflection looking at the whole wave – what are the insights?